Despite its steep $980,000 asking price, a Bishan executive maisonette was snapped up on the first day of an open house held to sell it. The buyers are a Singapore citizen and her Chinese-national father, and the seller is a Singaporean woman who is relocating to Shanghai for work. The price tag makes this the most expensive Housing Board (HDB) resale flat sold. 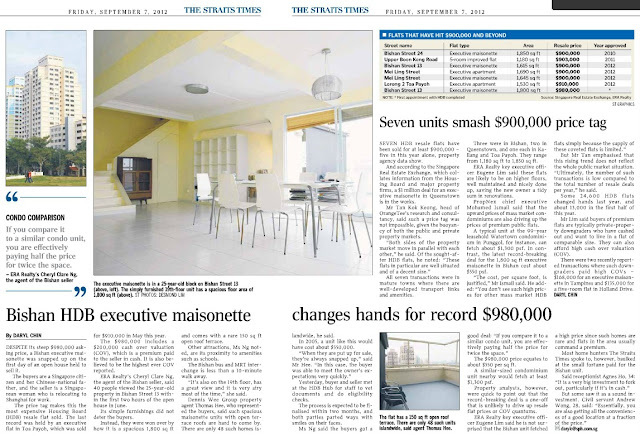 The last record was held by an executive flat in Toa Payoh, which was sold for $910,000 in May this year. The $980,000 includes a $200,000 cash over valuation (COV), which is a premium paid to the seller in cash. It is also believed to be the highest ever COV reported. ERA Realty's Cheryl Clare Ng, the agent of the Bishan seller, said 40 people viewed the 25-year-old property in Bishan Street 13 within the first two hours of the open house in June. Its simple furnishings did not deter the buyers. Instead, they were won over by how it is a spacious 1,800 sq ft and comes with a rare 150 sq ft open roof terrace. Other attractions, Ms Ng noted, are its proximity to amenities such as schools. The Bishan bus and MRT interchange is less than a 10-minute walk away. "It's also on the 19th floor, has a great view and it is very airy most of the time," she said. Such spacious maisonette units with open terrace roofs are hard to come by. There are only 48 such homes islandwide. In 2005, a unit like this would have cost about $550,000. Ms Ng said the buyers got a good deal: "If you compare it to a similar condo unit, you are effectively paying half the price for twice the space." The $980,000 price equates to about $550 per sq ft.
A similar-sized condominium unit nearby would fetch at least $1,300 psf. Property analysts, however, were quick to point out that the record-breaking deal is a one-off that is unlikely to drive up resale flat prices or COV quantums. ERA Realty key executive officer Eugene Lim said he is not surprised that the Bishan unit fetched a high price since such homes are rare and flats in the area usually command a premium.